Good things can happen when individuals with a shared vision meet. When Denis Granarolo and Carlo and Raoul Momo were brought together by a mutual acquaintance, the French Master Baker's boyhood dream of coming to America fit perfectly with the Princeton restauranteurs desire for fresh European-style bread for their customers. Since imported bread was never truly fresh by the time it arrived in New Jersey, the Momos did the next best thing. 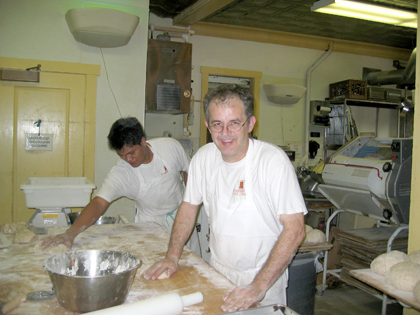 In 1998, they "imported" the baker and his family to the United States. Et voilà, Princeton's own boulangerie, the Witherspoon Bread Co., was born, adding to the town's cultural richness while serving the palates of Terra Momo patrons at the same time. Besides bread  ficelle, baguette, five types of focaccia, ciabatta, batard, challah, rustic sourdough, country boule, and nine varieties of dinner roll  the bakery offers varieties of croissant and brioche, as well as a selection of panini and desserts including tiramisu, fruit tarts, and éclairs from the kitchens of one of Terra Momo's four restaurants.